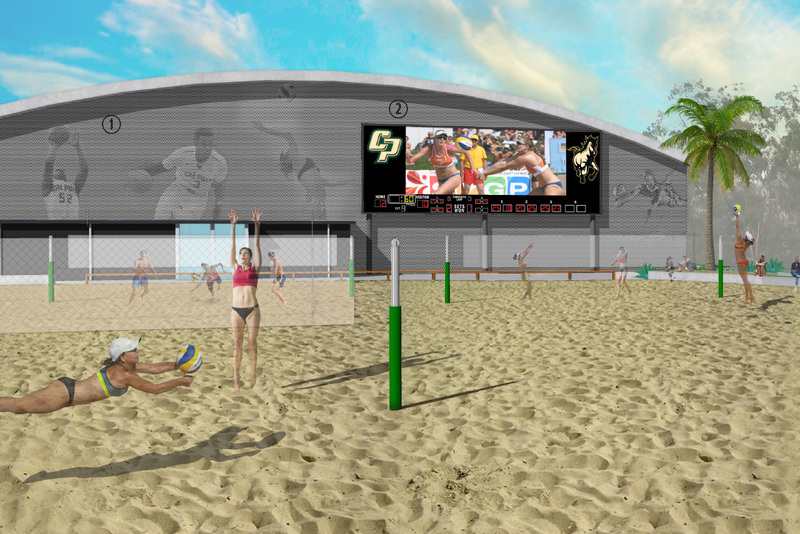 The Cal Poly Beach Volleyball team may get their own venue on campus in time for the 2019-2020 school year. A proposal for the construction of five new sand volleyball courts behind Mott Athletics Center awaits final approval by the University Space Management Committee. The primary reason for the new courts, according to head coach Todd Rogers, is to serve as a recruitment tool. Currently, the team switches between practices at the Recreation Center and Pismo Beach. Rogers said although both venues are adequate, the recreational courts exist for the student body, not for the team, and coordinating practices at Pismo Beach can be difficult. The team is currently one of the top 10 teams in the country, ranking No. 7 with a record of 3-3. Deputy Athletics Director Nick Pettit said the success of the team brought greater interest from donors to invest in the program, resulting in discussions with Rogers and a desire for an on-campus space for the team. The project aims to make the sport more accessible to students and encourage greater support for the program from the student body. Rogers said many people enjoy watching beach volleyball matches due to its different atmosphere from other sports. He said he hopes the “cooler ambiance around the courts” will attract more spectators for matches. The University Space Management Committee discussed multiple proposed sites for the courts Feb. 16, according to an email statement to Mustang News from Space and Facilities Utilization Manager Jeffrey Dumars. Pettit said that, ideally, the project will take place behind Mott Athletics Center, a preference based on the cost, feasibility and convenience of the site. Discussions during planning shed light on keeping the courts close enough to the Mott “hub” that houses the team’s locker rooms, training rooms and overall resources. The project is currently in the preliminary stages and Dumars said he anticipates that the Space Management Committee will take action on the proposal at the next meeting April 2. There is an additional sub-committee involved with the evaluation of recreational resource utilization on campus composed of staff from Associated Students, Inc. (ASI), Cal Poly Athletics, Academic Affairs and Facilities. This sub-committee met Feb. 27 to discuss the court’s project to further inform the next Space Management meeting. The Cal Poly Beach Volleyball team takes on Cal State Northridge and Cal State Bakersfield Saturday, March 9 at Pismo Beach.